To protect AC and DC railway vehicles from lightning and switching overvoltages, Sécheron experts recommend installing a surge arrester (SA1) immediately after the pantograph. For AC railway vehicles, we recommend installing a second surge arrester (SA2) between the main AC vacuum circuit breaker and the traction transformer. Sécheron has been delivering electrical safety components and solutions to the railway industry for decades. To protect AC and DC railway vehicles from lightning and switching overvoltages, we strongly recommend installing a surge arrester (SA1) immediately after the pantograph. For AC railway vehicles, we recommend installing a second surge arrester (SA2) between the main AC vacuum circuit breaker and the traction transformer to protect high-voltage circuits from surges due to current chopping when low magnetization currents are interrupted by the CB’s vacuum interrupter. 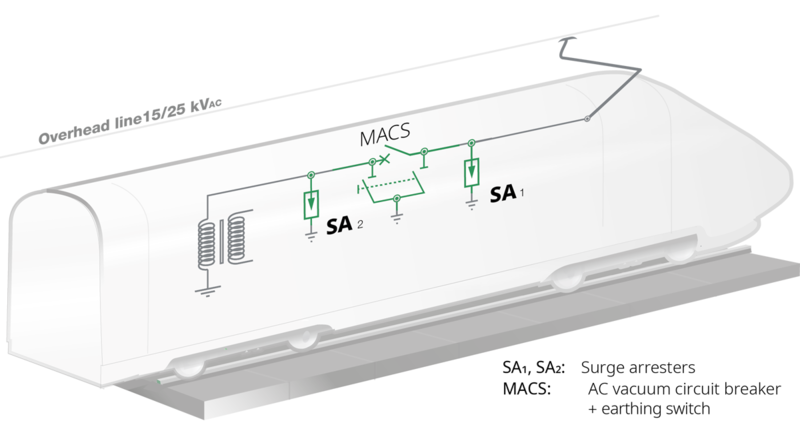 Surge arresters can be integrated into Sécheron MACS-type AC circuit breakers. We can also deliver solutions integrating our surge arresters in our smart, compact MODBOX®-type high-voltage electrical enclosures. Metal oxyde type surge arrester. DC applications 1.5 kVDC and/or 3 kVDC. Nominal discharge current 10 kA or 20 kA. High current impulse 100 kA. Available configurations for indoor or roof outdoor installation. Available configuration for speed up to 360 km/h (outdoor installation). Reference standards: IEC 60099-4 (AC); EN 50526-1 (DC).